Workers’ and Unions demonstrated the last days at the city of Kalamata denouncing the employers’ attempt to intervene in workers’ unions. With a series of election frauds, threats and blackmails, use of armed bodyguards, riot police forces and secret police, the employers and the leadership of GSEE(ETUC member in Greece) attempted to impose the presence of HR Managers, Presidents and CEOs of big business groups in the Congress of the Confederation of Greek Workers. They wanted for the capitalists to participate in workers’ unions and be elected as representatives of the workers. For this reason the GSEE leadership tried to organize a congress in secret and used the money of the workers unions to organize luxurious holidays in 5star hotels away from Athens, without any democratic procedure, without the presence of real workers. But their attempts failed after continuous massive and militant demonstrations of real Unions and workers. After their failed attempts to impose the capitalists inside the workers’ unions, the GSEE leadership locked the Congress area and blocked all efforts for a real workers’ congress. The class unions of Greece, the forces that rally with PAME, denounced the labour aristocracy of the GSEE leadership, for their role as mechanism of the employers inside the union movement. Their role is well known and that is why GSEE leaders receive huge funding and salaries by the Governments of Greece and the big business groups. 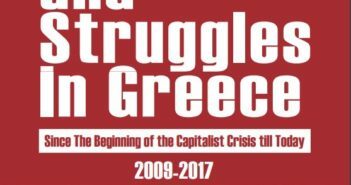 Once again the class unions of Greece reaffirmed their steadfast duty for unions of workers-for workers and the need to strengthen the class struggle, to organize more workers in the unions and overthrow the labour aristocracy, the forces of class collaboration and “social peace”, who are a real cancer in the union movement.